Cordite 35: Oz-Ko is now complete! If you’d told me in April this year that we’d still be posting content from our Oz-Ko issue in November, I would have called you barking mad. But that’s exactly what’s happened: what started out in 2009 as an idea for a straightforward issue devoted to new poetry from Australia and the Republic of Korea has now spawned three separate issues including one hundred and fifteen poems (of which over ninety are translations), almost two dozen features (including essays, articles, interviews and photo galleries) and two separate tours, to Korea and Australia, by a total of eight poets from both countries. Excuse me while I take a moment to reflect on that. Highlights from the Korean Poets’ Tour of Australia! In August 2011, Korean poets Kim Ki Taek, Park Ra Youn, Hwang Tong-gyu and Park Hyung Jun landed in Australia for a ten day tour. They presented at the Melbourne Writers Festival and in Sydney at the Redroom Poetry Company. The tour was a reciprocal visit following the Cordite/Asialink tour of Korea in May. My plan to start teaching phonetics in my Korean English class actually germinated in Nepal. I began to notice signs similar to ones I had seen in Korea, toting the English language as a kind of educational panacea. I found myself wondering if the modern world was engaged in a cultural war, an effort to arm itself with my mother tongue. A policy of Mutually Assured Comprehension. My drinking has always had a very narrow purpose, one that I’ve repeatedly given up without issue or pain; it is a bonus to rather than a facet of my days. But when I moved to Seoul I was confronted with a type of drinking attitude that insisted my commitment to alcohol be put to the test. For the first time I was taking part in a night life that had no half measures, no flip side to the coin: it’s go for a drink or go to bed. And if you choose bed, you better take a drink along. Brother Anthony of Taizé, known as An Sonjae in Korean, is a retired Professor of English who has lived in Seoul for the last twenty nine years. He is also one of the foremost translators of modern Korean literature into English. 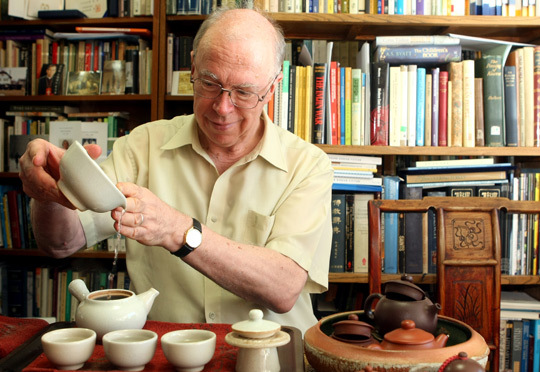 David Prater caught up with him over a cup of green tea to talk about Korean poetry and society, Ko Un and the future of inter-Korean relations.